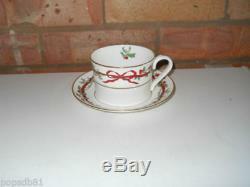 Royal Worcester Drum Shaped Tea Cup and Saucer - Holly Ribbons - Set of Six. Description Drum shaped tea cup and saucers. New/Used Used but still in good condition with a few light utensil marks. Comments A pattern of holly, mistletoe and ribbon combine to create this distinctive pattern, which Royal Worcester have described as the ultimate in festive entertaining This is a difficult to obtain pattern and you will see from my feedback that many customers have been pleased with the quality of the items that have been supplied. Have more items available in this pattern please have a look at my other listings. Thanks you for taking the time to look at my shop! I have new stock arriving weekly so please add me to your favourite sellers list and be sure to check my site on a regularly basis. If you have any questions please feel free to contact me and I will do my best to answer your queries. 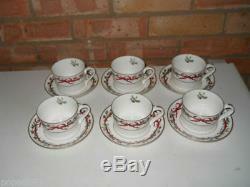 The item "Royal Worcester Drum Shaped Tea Cup and Saucer Holly Ribbons Set of Six" is in sale since Sunday, December 9, 2018. This item is in the category "Pottery, Porcelain & Glass\Porcelain/China\Royal Worcester\Tableware". The seller is "dawnsemporium" and is located in Birmingham. This item can be shipped to United Kingdom, Antigua and barbuda, Austria, Belgium, Bulgaria, Croatia, Cyprus, Czech republic, Denmark, Estonia, Finland, France, Germany, Greece, Hungary, Ireland, Italy, Latvia, Lithuania, Luxembourg, Malta, Netherlands, Poland, Portugal, Romania, Slovakia, Slovenia, Spain, Sweden, Australia, United States, Canada, Brazil, Japan, New Zealand, China, Israel, Hong Kong, Norway, Indonesia, Malaysia, Mexico, Singapore, South Korea, Switzerland, Taiwan, Thailand, Bangladesh, Belize, Bermuda, Bolivia, Barbados, Brunei darussalam, Cayman islands, Dominica, Ecuador, Egypt, Guernsey, Gibraltar, Guadeloupe, Grenada, French guiana, Iceland, Jersey, Jordan, Cambodia, Saint kitts and nevis, Saint lucia, Liechtenstein, Sri lanka, Macao, Monaco, Maldives, Montserrat, Martinique, Nicaragua, Oman, Pakistan, Peru, Paraguay, Reunion, Turks and caicos islands, Aruba, Saudi arabia, South africa, United arab emirates, Ukraine, Chile.